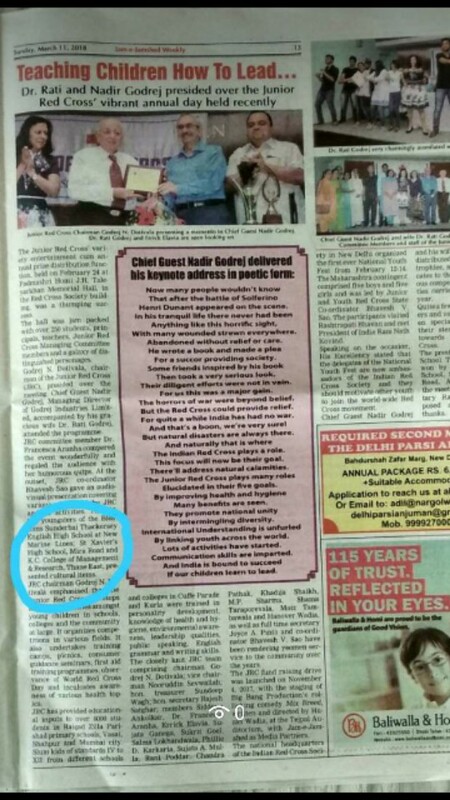 के सी कॉलेज ऑफ इंजिनीरिंग ठाणे ने जपली सामाजिक बांधिलकी !! दैनिक सामना १६/०२/२०१९ :- दैनिक सामना १६/०२/२०१९ :- के सी कॉलेज ऑफ इंजिनीरिंग ठाणे च्या विदयार्थ्यांनी ठाकूरपाडा येथील पिंपरी गावामध्ये जाऊन आरोग्य आणि उद्योजगता शिबीर सारखे विविध उपक्रम राबविले आणि आपली सामाजिक बांधिलकी जपली!! K.C. 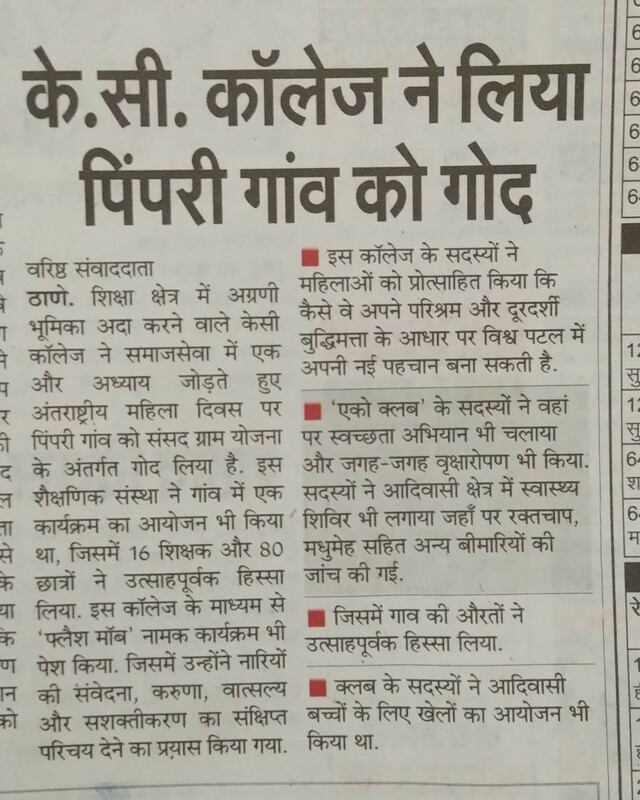 college celebrates world women day with so much enthusiasm. They organised so many activities at Pimpari on this occasion such as women health check up camp, Eco-awareness, Flash Mob etc. 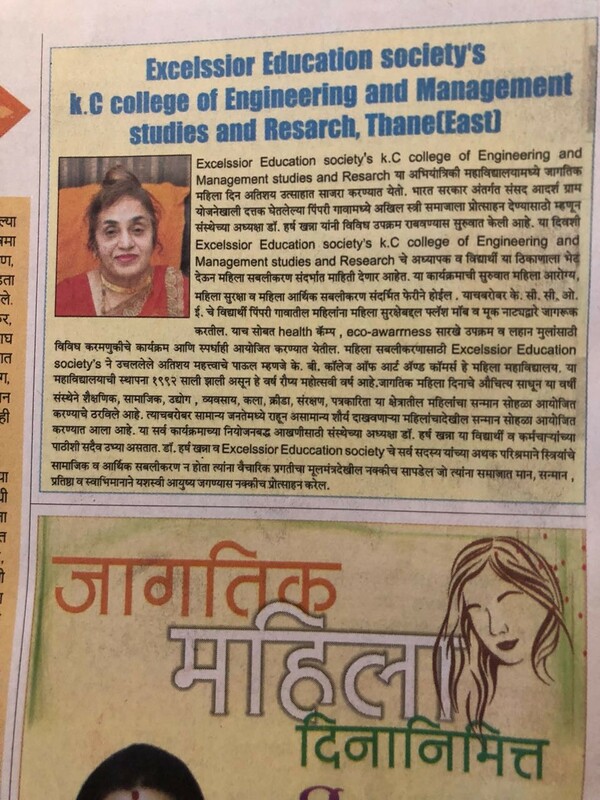 Dr. Puja Rai Pradhan said that our college supports career oriented education to the students. So that they can face different challenges in society as well as industry. 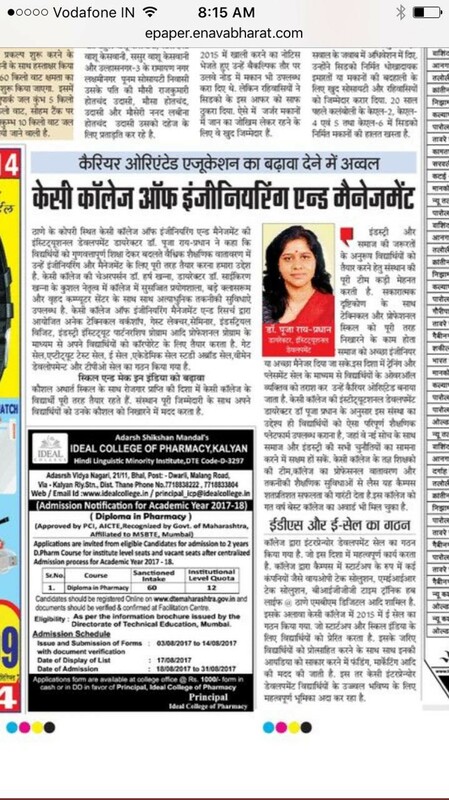 Entrepreneur Development Cell of K.C. 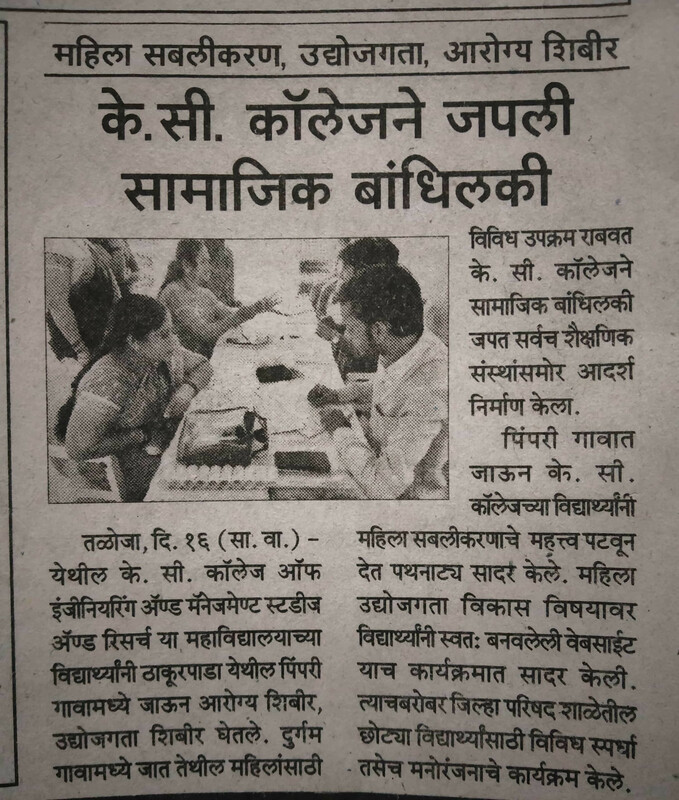 College of Engineering and Management Studies and Research organised seminar on "Women Entrepreneurship Development", Eco-club organised plantation and Women Development Cell organised health check up camp for women. 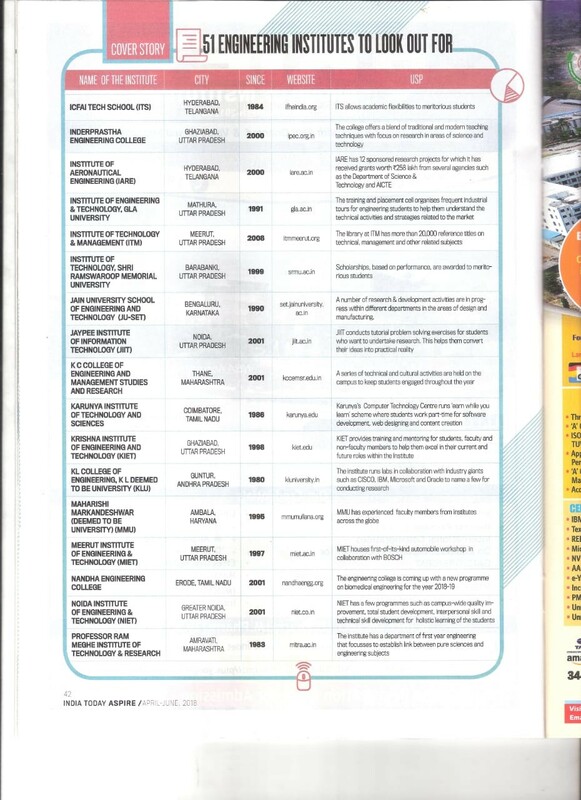 K.C College of Engineering and Management Studies and Research is very happy to announce that it has been ranked at 9th place in the list published by India Today Magazine for TOP 51 ENGINEERING COLLEGES O LOOK OUT FOR 2018. It was only possible due to the various numbers of technical and cultural programme/activities carried out throughout the year for over all development of students and make them future ready to take up challenges in the fast paced environment. 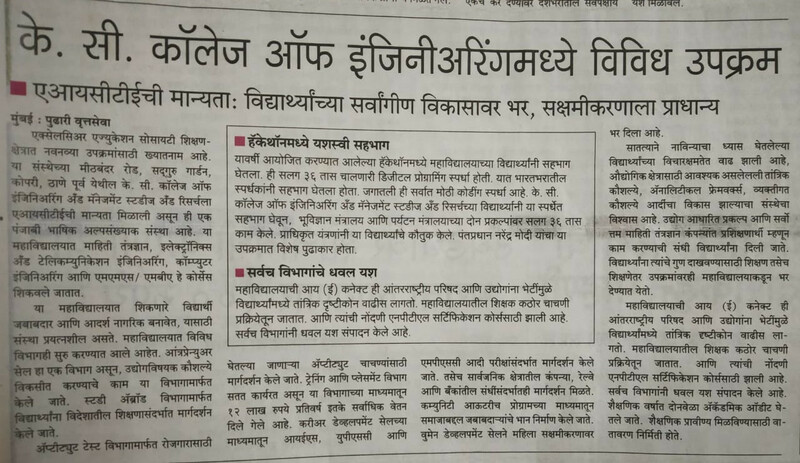 Also the above mentioned point has been mentioned as USP for K C College of Engineering and Management Studies and Research. 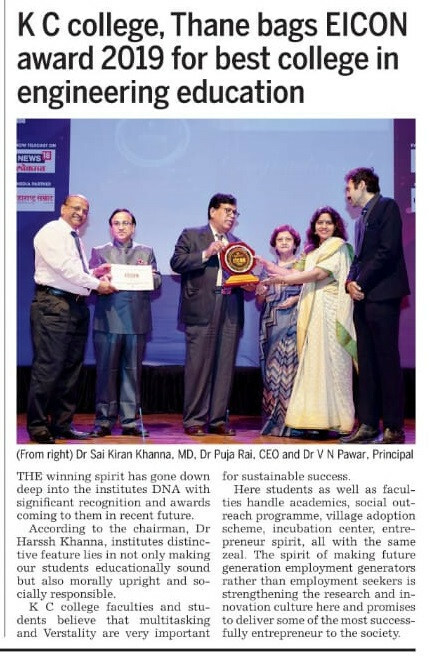 It is indeed a matter of pride for the college and we thank India Today Aspire magazine team for this recognition. 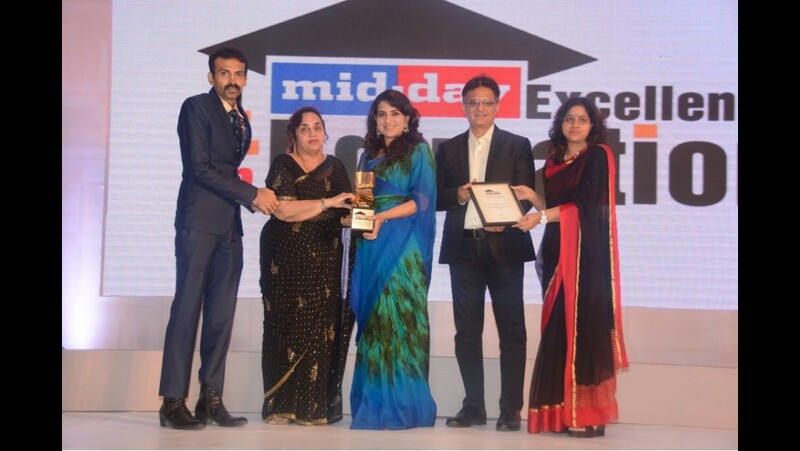 K. C. College of Engineering and Management Studies and Research bestowed with mid day award for excellence in Engineering and Management Education 2018. Students and faculties of K.C. 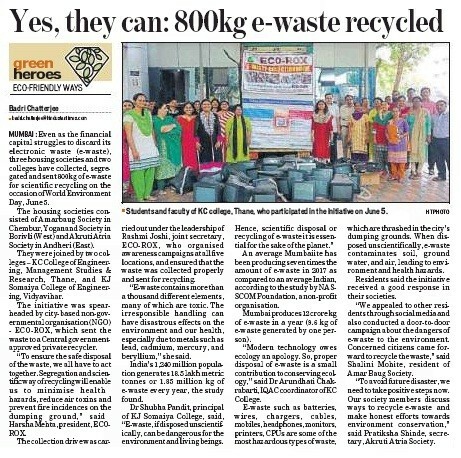 College of Engineering and Management Studies and Research, Thane participated in initiative on June 5, 2018. 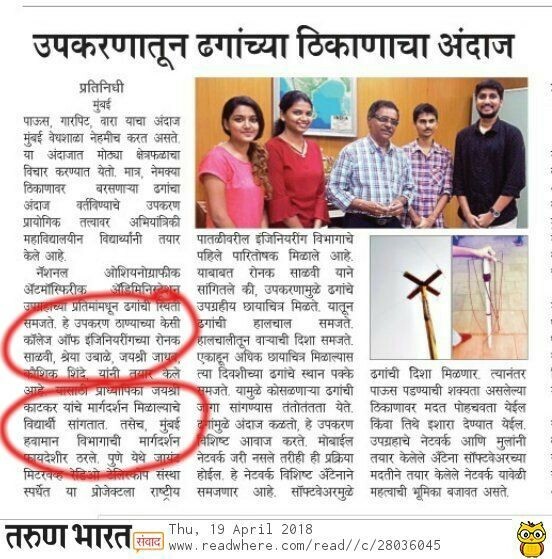 Our final year EXTC department students Mr. Ronak Salvi, Mr. Kaushik Shinde, Ms.Shreya Ubale, Ms. Jayshree Jadhav done project in collaboraqtion with India Meteorological Department , Colaba under the guidance of Prof. Jayshree Katkar , got appreciated in media (Tarun Bharat newspaper). 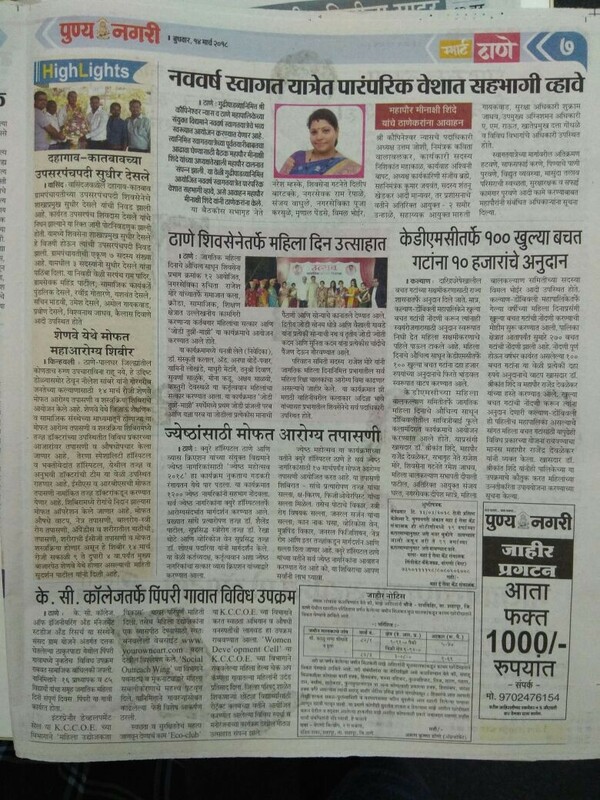 K C College of Engineering believes in "Developed Nation Developed Village" , through this the college has adopted a village in Pimpri (Pune) under Sansad Adarsh Gram Yojana (SAGY). 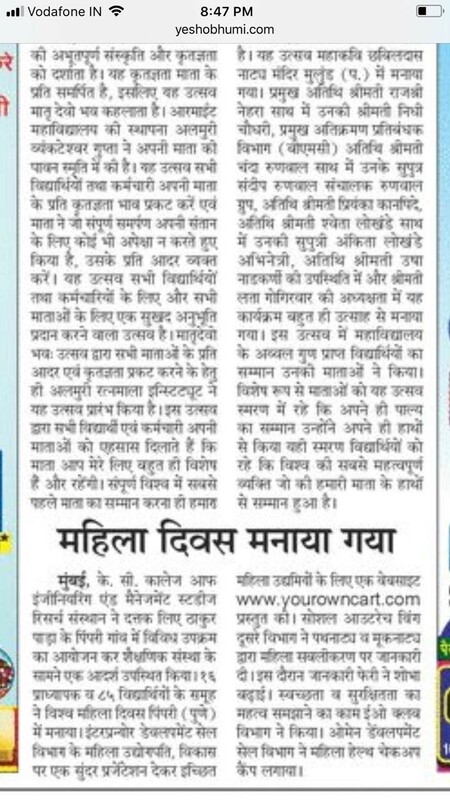 To make the celebration of Women's day , the college organized various events and programs for the betterment and growth of the children and women of the village. In day today life increases cyber crimes on social platform and online frauds. 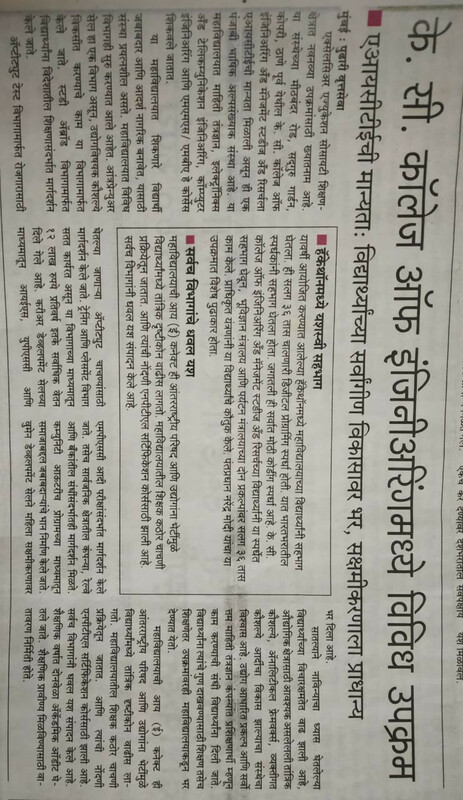 K C College of Engineering took an wonderful initiative to organize an "Awareness program on Cyber Crime" in association with Police Cyber Cell, Thane. 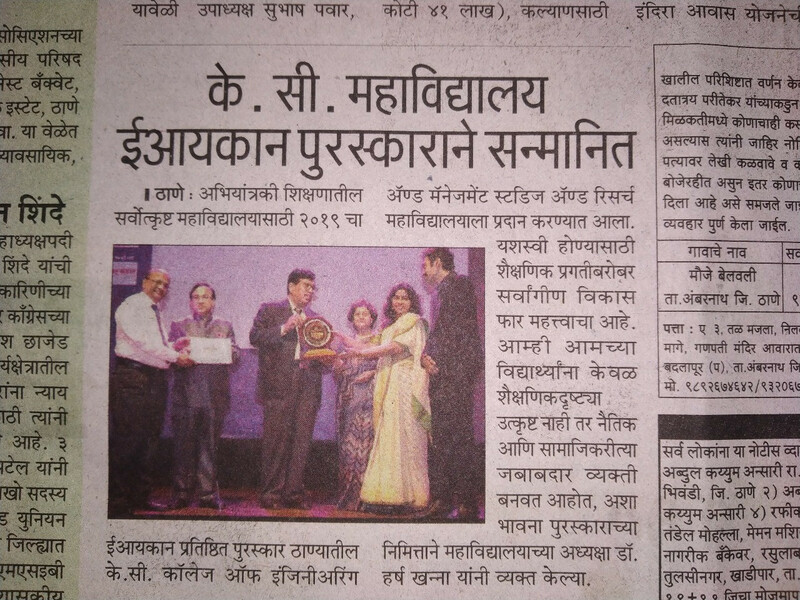 Mrs. Godrej appreciated K C College of Engineering's YRC team for performance on "Gender Equality" at annual meet. 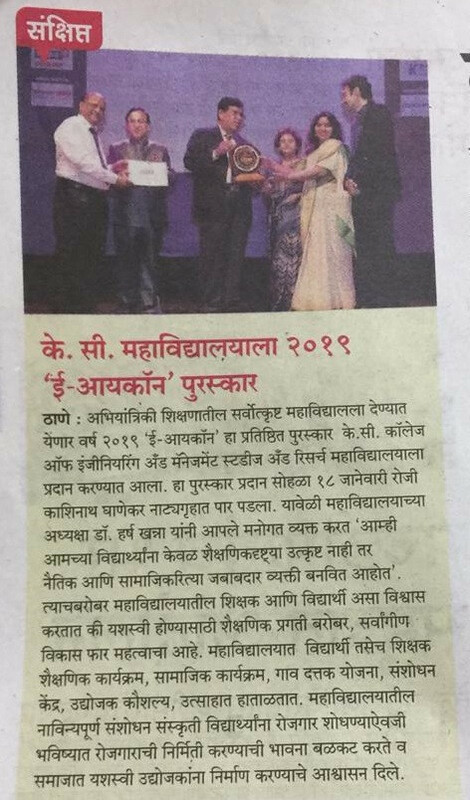 The onset of 2018 for Department of Electronics & Telecommunication started with a bang as our two teams went for a National level Project competition at (Giant Metrewave Radio Telescope (GMRT)Pune which is the world's most powerful radio telescope operating at low radio frequencies, has been built and is operated by the NCRA-TIFR under the control of DAE, Govt. of India.